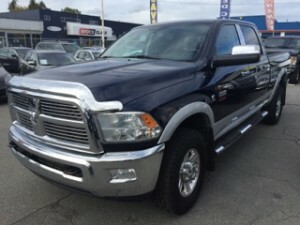 Are you seeking a Used Dodge Ram Diesel 3500 For Sale In BC? Country Road Auto Sales has just what you need! The 2012 Dodge Ram 3500 Laramie has always been regarded as an impressive piece of machinery. Premium leather heated/cooled seats, saddlebag seat backs, navigation, power sunroof, and a premium sound system that makes this awesome truck even more fun to drive! Perhaps you require a pickup truck for work or just a truck for play, the 2012 Dodge Ram 3500 Diesel will suit your needs for a truck when you need the best. It’s tough to tame a one-ton, but somehow, Dodge did it with the 2012 Laramie Crew as it is not only luxurious, but actually comfortable to drive. Parking? Well, hopefully you are just good at it! The transformation to the Laramie trim package is amazing! Suddenly, leather trimmed bucket seats are part of the package, along with heated second row seats, ventilated front seats, an AM/FM/Sirius/Hard Drive audio system, 17 inch aluminum wheels and a bunch of brightwork to make it look…nice, and you can actually call this 1 ton pickup….pretty. Is that ok to say about a RAM??? 2012 Dodge Ram 3500 Laramie 4X4 6.7L CUMMINS TURBO DIESEL. This article is about the full-size truck since Ram’s separation from Dodge. The Ram Pickup (formerly theDodge Ram) is a full-size pickup truck manufactured by Chrysler Group LLC. As of 2010, it has been sold under the Ram Trucks brand. Previously, Ram was part of the Dodge lineup of light trucks. The name Ram was first used in 1981 on the redesigned Ram and Power Ram following the retiring and rebadging of the Dodge D Series pickup trucks as well as B-series vans. The truck is named for the Ram hood ornament that first appeared on Dodge vehicles in 1933. The Ram Truck is in its fourth generation as of the 2009 model year.